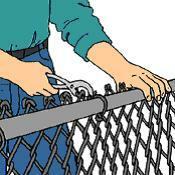 Chain link fences are durable and can provide excellent security. Because these fences don’t block views, they are a good choice for keeping an eye on pets and small children. Most home centers, lumberyards, and fence suppliers stock all of the parts required — chain link mesh, posts, rails, and hardware. Just tell the dealer how long and how tall you want the fence to be. He or she will help you select necessary components to build the fence. Specify whether or not you want to include a chain link gate in the project. 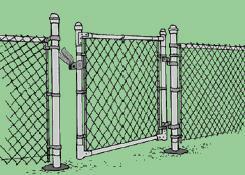 Many people are intimidated by the number of components in a chain link fence and although tall fences are best installed by a fence contractor, low chain link fences (48 inches or less) are actually simple to install. The biggest challenge may be tracking down a fence puller, the tool that stretches the chain link mesh between the posts. 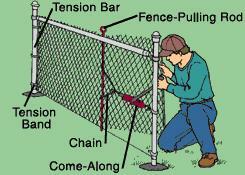 A fence puller consists of a winch known as a come-along, a chain, and a fence-pulling rod. 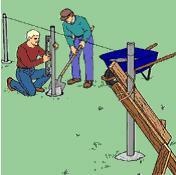 You may have to check several tool rental shops before you find one that carries fence pullers. 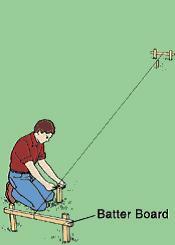 The first step in building a fence is planning the layout and then marking the fence location with stakes and string. Once you’ve done that, mark post locations along the string with bright-colored chalk. If you’re installing the fence on a property line or if the fence must meet certain setback requirements, you’ll need to establish the exact location of the line to avoid disputes with neighbors or to make sure the fence meets local ordinances. 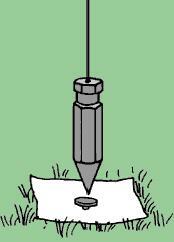 Once you’ve located your property lines, mark the corners with surveyor’s stakes or other markers. If you’re building a fence within the property, establishing the locations of end posts and corner posts is usually done by measuring out from one or more existing reference points on the property, such as the house, the driveway, an existing fence, or other landmarks. The information here explains how to locate posts for a straight fence built on flat ground with corners meeting at 90 degrees. It is likely your situation is not so ideal, but with these instructions and a little common sense, you can lay out posts for just about any fence design. 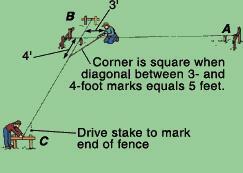 Drive a 1x2 stake firmly into the ground, marking each end of the fence line. Drive a small nail into the top of each stake marking what will be the center of the fence posts. Stakes typically project 4 to 6 inches above ground; however, taller stakes may be required for the string to clear low obstructions along the fence line. 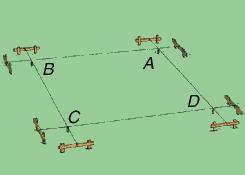 Begin with the side you have laid out, which has the corners A and B in the drawing. Put a batter board about 12 inches beyond the approximate location of the third corner and another one about 12 inches beyond the opposite corner--corner B in the drawing. String a line from crosspiece to crosspiece so that it crosses the nail in the corner stake at point B. From the same corner stake, measure out 3 (or 6) feet along one string and 4 (or 8) feet along the other, and mark these measurements on the strings. Once you've established the fence line with stakes and string, measure the total length of each side from corner to corner. Then measure and mark the location of the center of each line post along the string, spacing them no farther than 96 inches apart or as specified in the manufacturer's instructions and local building codes. Also establish the placement of the posts for the gate, if any. Use a plumb bob to transfer the marks from the string down to the ground and mark each post location on the ground using a nail stuck through a piece of paper or with a stake (Fig. 4). Once all of the marks are in place, remove the string. 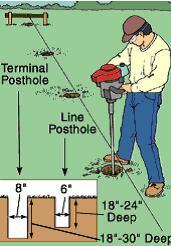 Using a posthole digger or a hand or power auger (which can be rented), dig the postholes. Terminal (end, corner, and gate) posts typically have a larger diameter than line (intermediate) posts. Postholes for terminal posts are typically 8 inches in diameter, and 18 to 30 inches deep. Holes for line posts are 6 inches in diameter and 18 to 24 inches deep, depending on the fence height and soil conditions. As you work, test for tautness by pinching the mesh shut. The fence is taut enough when the openings close no more than about 1/2 inch. Weave a tension bar into the mesh even with the terminal post. Using lineman’s pliers, cut the top and bottom links just beyond the tension bar. Undo the wire between the cuts to separate the mesh into two parts. Attach the tension bar to the tension bands using carriage bolts.